This is my laid back Sunday outfit. Wore this when I visited my Grandparents... and when I threw a major tantrum before leaving the house. 3 days later my back and arms still hurts from throwing 1 million things. It started over a disagreement between Mich and I, which, when I think of it now, was not really a big deal. Haha. Nag dramarama sa hapon lang ako. Haha. I'm the most patient person ever. I seldom get mad or pissed, but when I do, it's like all hell broke loose. Casualties that day: Melody the teddy bear which I dismembered (accidentally then intentionally), and our table lamp which I accidentally--not intentionally-- knocked off & severed. And then there were maybe 5 broken CDs. Heh. If I end up in trial or jail in the future, please don't use this post against me. Haha! I think in some way I needed that. It's like all my frustrations and anger and disappointments exited my body together with my tears. Sometimes, you need to unleash all the monster energy hiding inside too, you know? But do it without hurting anyone! A teddy not 4 feet tall would be fine though. Lol. Mich, up to this day, still screams "Murderereeeer!" whenever she remember or sees teddy bears. Haha. First off, sorry for the weird facial expressions. I was in a rush coz it's actually drizzling when I took the photos! Twenty seconds later, it rained like crazy! Anyway, back to my outfit. Been abusing my Payless neon green sneakers for weeks now. It was one of those meant-to-be impulse buys. It was a steal for P600! I think this is sold out already though. Bought it when I tried to do pullouts in my neon green wedges and I miserably failed. Guys, wear something you can run in when doing pullouts, especially if you have time constraints. 'Kay? I won't even try to explain how I put together this outfit (other bloggers are better at it), my goal is to share with you guys the pieces I'm wearing. This lovely highwaist floral shorts from Bratinela fits like a glove. Weird, but you get my point. And guys, when buying accessories, it's best if you have that 1 versatile piece you can wear in several ways. Take for example, this orange chain headband I'm wearing! Which is actually a wraparound bracelet, which could also double as a necklace--or belt! Db? Bongga. Speaking of shoes, do checkout Shoe Etiquette's new collection! Can you guess which pair I got? 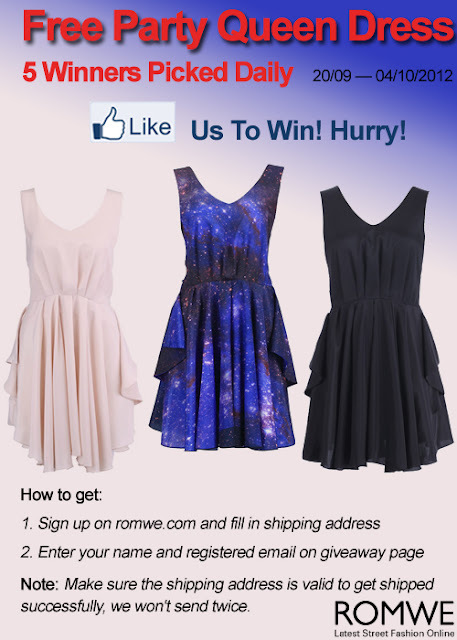 And don't forget to join ROMWE's Party Dresses Giveaway! They are giving away these dresses to 5 winners daily! Valid before October 4th. Open worldwide. Alam ko na gift sayo next time!!! Teddy bears!! ♥ Hahaha okay lang yan, Pax. Sarap mag-release ng emotions through that once in a while. ONCE IN A WHILE TALAGA? Hahahaha! Ganda mo girl! Hope to see you soon!